You are here: Home ¡Vamos al final! The candidates for the finals on Friday are set! With Spain's Paula Soria and Belén Carro and Canada's twins Megan and Nicole McNamara the audience can look forward to an exciting women's final on the last match day. In the semi-finals, two German men's teams - the twins Bennet and David Poniewaz and Dan John with Eric Stadie also prevailed. 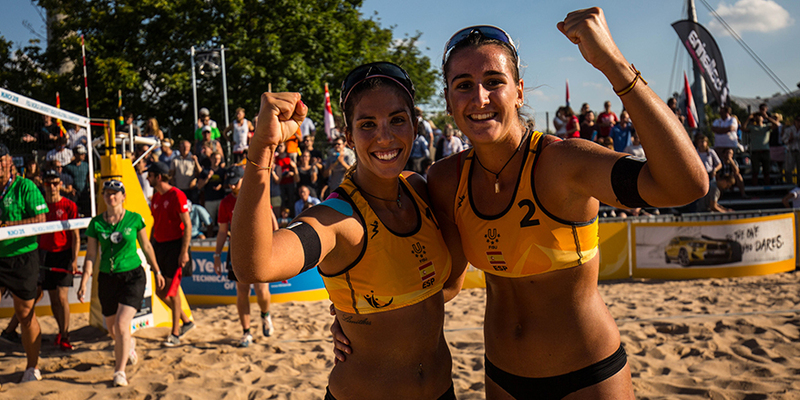 In the women's first semi-final, the Spaniards Paula Soria and Belén Carro and the Americans Emily Sonny and Torrey Van Winden delivered an exciting first set, which the Spaniards could only win 29:27. In the second set, however, the Spaniards clearly dominated and deservedly made it into the final (29:27, 21:13). "In the first set, the Americans were really strong. In the second we were able to improve our serve on the player on the net, Torrey Van Winden," explained Carro after the match. The second women's semi-final was also a real nerve-wrecking game. Zoé Vergé-Dépré and Esmée Böbner from Switzerland and the Canadian twins Megan and Nicole McNamara did not give up a single point, especially in the first set. Only in the tie-break the decision was made for the Canadian twin team (28:26, 16:21, 9:15). "We have reminded ourselves to remain calm and powerful and to cheer up. These are the factors that matter in such tight games - that's the only way to win in the end," said Nicole McNamara. After John’s and Stadie's sensational victory against the Dutch Ruben Penninga and Tom van Steenis in the quarter-finals (16:21, 21:16, 16:14), the decision in the semi-finals was only made in the third set. "We wanted to serve on Friedl and put pressure on him. That worked very well in the first set, but unfortunately not in the second," John explained the strategy. Accordingly, the second set went to the so far undefeated Austrians (21:17). The third set was even until Germany turned up the heat at 9:10 and won the game with six points in a row. "The tie break was even overall. In the end, we changed our tactics. I pretended to play diagonally as a blocker but played Longline instead. Eric's strong defence secured us a place in the final," John summed up the furious finish. The Poniewaz twins went into the semi-finals as favourites after their strong appearance in the quarter-finals against the Frenchmen Olivier Barthelemy and Romain Di Giantommaso (21:19, 21:18). The Germans left little doubt about their role as favourites against the Swiss from the start and won clearly after two sets (21:17, 21:13). A lack of coordination by the Swiss and a strong block played by the Germans led to two clear set wins. "The Swiss are known for defending themselves well. But we played a lot of longline and it worked out well," David Poniewaz was pleased. The loud support of the fans inspired him: "The crowd is simply crazy. The atmosphere is outstanding." In the morning the Spaniards Oscar Jiménez and Hugo Rojas narrowly missed the semi-finals. In the tie-break the Austrians Friedl and Trummer could finally prevail (18:21, 21:16, 9:15). The Australians Paul Burnett and Maximilian Guehrer can now only reach seventh place in the ranking games. They lost in two sets against the strong Swiss team (21:17, 24:22). In the women's competition, Katja Stam and Pleun Ypma from the Netherlands were defeated by Emily Sonny and Torrey Van Winden from the USA (21:17, 21:08). In an exciting match, Claire Coppola and Kristen Nuss, the second team of the Americans, bid farewell to their medal hopes (17:21, 21:18, 15:13) against Canada. Tomorrow at 3:00 pm the ladies will open the final round at the Centre Court. After a successful tournament, the Canadian McNamara twins and the Spanish women Soria and Carro have reached the women's final. 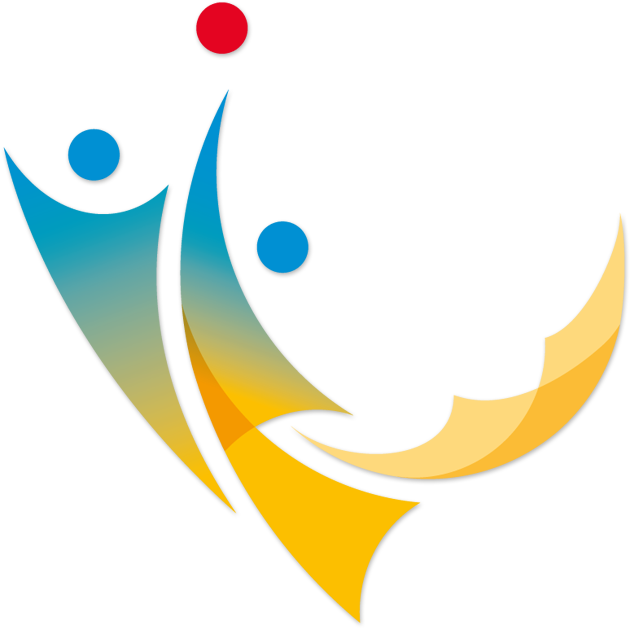 The matches for places three to eight in both the men's and women's tournaments will take place beforehand. The final decision for the men will be made at 4:00 pm. One thing is for sure: both silver and gold will go to Germany. The only question is if twins Bennet and David Poniewaz or Dan John and Eric Stadie will win the gold medal?